Reading and share top 7 famous quotes and sayings about Transformative Change by famous authors and people. Browse top 7 famous quotes and sayings about Transformative Change by most favorite authors. 1. "If Abstract Expression reached for the sublime, Pop turned ordinary imagery into icons. Roy Lichtenstein and Andy Warhol illuminated the transformative power of context and the process of reproduction. Claes Oldenburg's soft ice-cream cones and hamburgers changed sculpture from hard to soft, from stasis to transformation." 2. "Writing is literally transformative. When we read, we are changed. When we write, we are changed. It's neurological. To me, this is a kind of magic." 3. "Funny, transformative events were not always scheduled and not always expected. Yeah, sure, your change turned you into a male. And when you went through the mating ceremony, you were part of a whole. No longer just yourself. And the deaths and the births around you made you view the world differently. But every once in a while, from out of the blue, someone reaches the quiet place where you spend your private time and changes the way you see yourself. If you're lucky it's your mate…the transformation reminds you once again that you are absolutely, positively with the right person: because what they say doesn't touch you because of who they are to you, but because of the content of their message. " 4. "Nirvana manifests as ease, as love, as connectedness, as generosity, as clarity, as unshakable freedom. This isn't watering down nirvana. 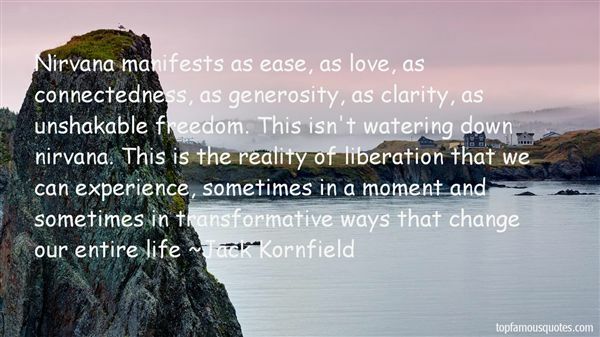 This is the reality of liberation that we can experience, sometimes in a moment and sometimes in transformative ways that change our entire life"
5. "I was not a very popular kid in high school, and I had this idea that the way that I dressed would change how liked I was. It was that kind of Pygmalion story. I think, ultimately that's probably why I became interested in fashion, its transformative power, and how it can change your identity." 6. "We define learning as the transformative process of taking in information that, when internalized and mixed with what we have experienced, changes what we know and builds on what we can do. It's based on input, process, and reflection. It is what changes us." 7. "One of the paradoxical and transformative aspects of implicit traumatic memory is that once it is accessed in a resourced way (through the felt sense), it, by its very nature, changes. 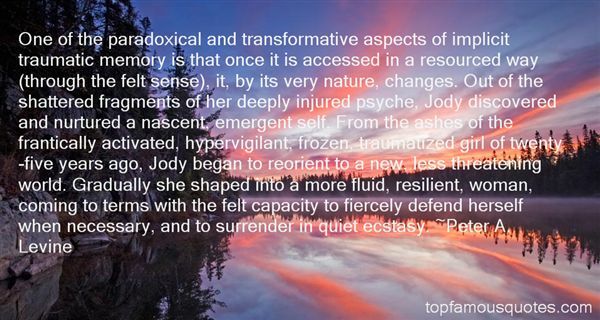 Out of the shattered fragments of her deeply injured psyche, Jody discovered and nurtured a nascent, emergent self. From the ashes of the frantically activated, hypervigilant, frozen, traumatized girl of twenty-five years ago, Jody began to reorient to a new, less threatening world. Gradually she shaped into a more fluid, resilient, woman, coming to terms with the felt capacity to fiercely defend herself when necessary, and to surrender in quiet ecstasy." How is it?" I ask as we stroll towards the dressing rooms. "Working at the playground. That must be fun. ""Sure, they're just adorable," she says, "For the first five minutes. And then I want to wring their adorable little necks. "I stop, shocked. "I always figured you loved kids. ""Yeah, no." Kayla shakes her head emphatically. "One kid, I can do, even two-- just stick them in front of a Disney movie, let them play Xbox all night. But a herd of them?" She shudders."